Geolocated Flickr Photos: Uses geolocation and loads flickr photos that have been geotagged near you. YQL open tables for FourSquare: A new open table for YQL that makes some of the most useful features of the Foursquare API easily accessible. The other APIs can be quickly implemented based on the work so far. Foursquare Nearby Locations: Foursquare venues near you, plotted on a map. Uses the YQL Geo Library and the above Foursquare YQL Open Table. How far did I…: Uses Google Maps and the FourSquare YQL Open Table to calculate walking and driving distance in the last x days, up to the last 40 checkins. I may make additional posts about each, time permitting, and discuss the technologies or problems involved in each. 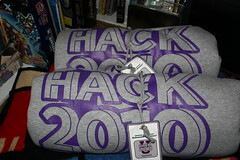 Our hacks from previous years were the Campus Map Mashup (2008) and FlyBy (2009).